Treat your vegetarian guests to these delicious filo parcels filled with mushrooms in a creamy, garlicky sauce. 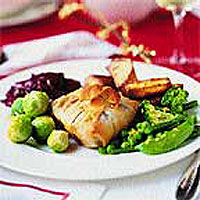 Make in advance and freeze, or make the night before then simply reheat on Christmas Day. Preheat the oven to 200°C, gas mark 6. Place the dried mushrooms in a bowl, cover with 150ml boiling water and leave for 15-20 minutes. Wash the leek and dry with kitchen paper. Finely chop the parsley. Melt the butter in a pan and gently fry the leek and fresh mushrooms for 6-7 minutes until they begin to soften. Strain the dried mushrooms, squeezing out and reserving the liquor. Add to the pan with the rice, half the Madeira and the soy sauce and simmer for 3-4 minutes. Remove from the heat and stir in the cheese and parsley. Season generously and allow to cool slightly. Brush 1 sheet of filo with butter then place another sheet on top. Trim to a 20cm square, reserving the excess pastry. Brush the edges with butter, then place a quarter of the filling in the centre, shape to form a square, then fold the pastry to seal and turn over. Trim the excess pastry into 3 x 4cm strips and fold in half lengthways. Wrap 2 strips around the pastry squares, tucking under to form a parcel. Make a 'bow' with the last strip. Repeat to make 4 parcels. Place on a greased baking sheet, then brush with the remaining melted butter and bake for 25-30 minutes until crisp and golden. Meanwhile, bring 100ml of the mushroom liquor to the boil, remove from the heat and stir in the crème fraîche with the remaining Madeira. Season, then serve with the filo parcels. Prepare up to the end of Step 4, but don't cook. Wrap the parcels in greaseproof paper or clingfilm, then freeze. Bake from frozen in a preheated oven for 35-40 minutes at 200°C, gas mark 6. Freeze the reserved mushroom liquor too, then defrost on Christmas Eve to make the Madeira sauce. This recipe was first published in Mon Dec 01 00:00:00 GMT 2003.